There were so many books that we read as kids that have been turned into movies. Personally, I don’t think a good majority of these books really needed to be retold in a different light, but hey that’s me. Heck, I would rather watch a movie based on Alexander and the Terrible, Horrible, No Good, Very Bad Day…which I guess is actually being made after looking it up. 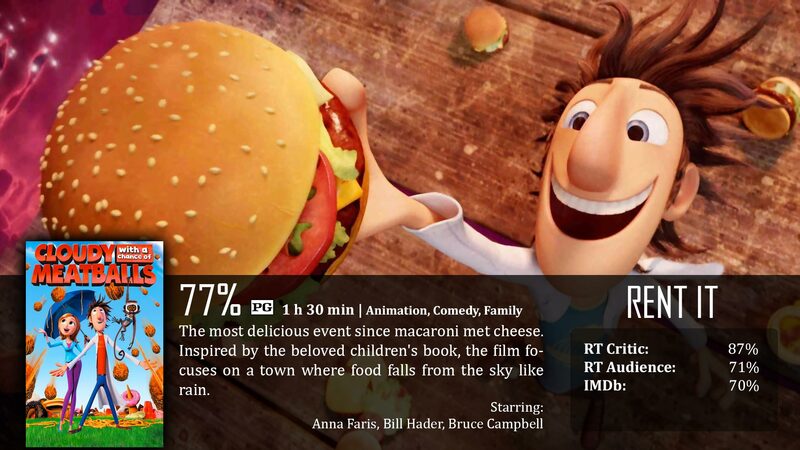 Anyways, Cloudy with a Chance of Meatballs is a film based off of a kids book that I pretty much almost completely forgot about until the movie came out. Watching it reminded me of some things, and I’m generally happy that the movie was actually made. What the movie is about is this inventor by the name of Flint Lockwood that has the well-known dream of fame, but because of his “nerdy” past, he was never really able to be recognized for his brilliance…until one fateful day. Flint creates a machine that transforms the molecular compounds of H20, mixes in a little radiation and chemistry, and voila…food. Or in laymen’s terms, he makes a machine that turns water into food. This machine gets stuck in the sky, and he is able to feed the entire town by changing the rain into meals. So he gets famous, and his popularity becomes his number one concern, making him lose track of the dangers of his machine. I first had a problem trying to figure out the kid-friendly messages this movie was trying to get across, but then it was louder than a banshee cry. It was first about popularity – how we all want it, but why it’s not necessarily always a great thing, and how it “clouds” our judgment as well as pushes those closest to us away. It was about being honest with each other and accepting who we are as people and being true. Plus, what kid movie wouldn’t be complete without having an overall theme of doing what’s right, no matter the cost? So yes, there is actually a lot of important messages in this film, so I will give it props for that. Yes the science doesn’t make any sense, but it is explained in a smart enough-sounding way for kids to almost believe it, but beyond that, it’s not meant to be realistic. The premise, character traits, appearances of people, etc, are all blown wildly out of proport ion. It’s more of a cartoon than it is a computer animated feature. However, half of the time, the movie is self-aware and acknowledges all of these problems as a kind of in-joke to keep the comedy in the film strong. For the most part, I think the humor is a bit young for me, but there are some good slapstick moments here and there for the whole family to enjoy. Basically, it knows what it wants and it went for it. The tones remain consistent throughout the film in every regard, and that’s important for films like this. The voice casting seemed a bit odd for me in general, but I think they did their job to their fullest. I think the music is pretty forgettable. The animation is beautiful though, no one watching will be likely to disagree with me on that one. Kids like colors and lights, and this film surely delivers. I am mostly just worried about the sequel. I know nothing about the second film, but I know one thing. This film feels complete. There is definitely no real need for a sequel, because the story is done. We are taught reasons not to give into popularity. He learns his own important lessons. What is the sequel going to do? Tell them all over again? I’m not sure, but I’m set to watch that one soon, so I’ll let you know my thoughts. This is a really good kid’s film. The messages are really good for kids and families, the colors are bright and vibrant, the animation is funny and fresh, and the tones remain consistent throughout for a general good time at the movies. It may not be the best option for the whole family as much as younger kids. Some jokes make more sense with a younger crowd and older family members are left only with the more absurd slapstick moments in the film, which just isn’t as appealing as the film in its entirety for younger viewers. Flint Lockwood: Come on, Steve. We’ve got a diem to carpe!